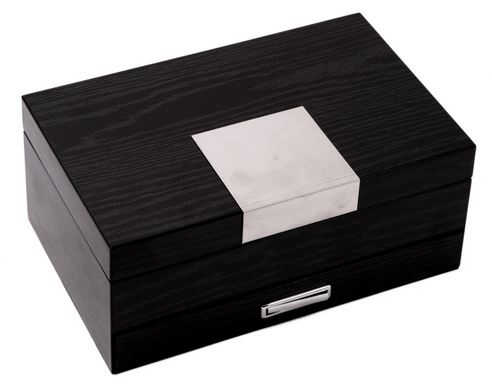 Lacquered 2 level jewelry box with single drawer, ring rolls, necklace hooks under lid, plush velour lining & stainless steel accents. 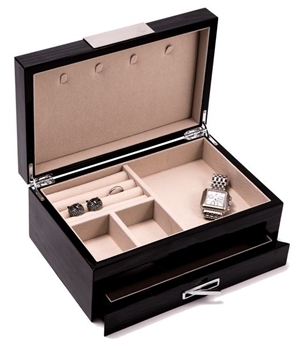 Multiple top compartments, open drawer. Cushion Side Design Jewelry Armoire, 8 Drawers Large Cushion Side Jewelry Armoire, 9 Drawers Locking Jewelry Armoire with Necklace Sides - Cream (OVERSTOCK SALE PRICE ON THIS ARMOIRE) Royal Gold Musical Egg Trinket Box plays "Swan Lake"